The world gasps in horror as news spreads of 12 people shot dead in Paris during a cold-blooded act of terror. Then the killers flee in cowardly fashion. All because of a few cartoons. All acts of terrorism incense me and strike me as senseless. Killing humans to make a point seems asinine and counterproductive. But as a journalist, the attack at French satirical magazine Charlie Hebdo struck me particularly hard. Those victims were killed for doing their jobs. For making sure more than one side of an issue is heard. For exercising their freedom of expression. Let me be the first to say I do not always agree with the content of that magazine, or of other media sources. Sometimes I find it offensive and become angry. However, I support the employees’ right to say, draw and print what they wish. I support the right of people to discuss things they like or don’t like. This is what freedom means, the ability to engage in civil discourse even if the subject matter offends or shocks some people. Regardless of whether or not people agree with the ideas being conveyed, freedom of expression must not be oppressed. Not all people in all countries live with that freedom. I have no idea what content on that puppy video website prompted the warning, but it certainly left a bad taste in my mouth. It shocked me to experience another country’s absence of something I possess at home and take for granted. So often we forget how grateful we are to have such simple freedoms until they are taken away. Just as I think it’s unethical for governments to oppress their citizens, I think it’s reprehensible for terrorists to do the same. The plot targeting Charlie Hebdo employees appears as a foolish means of achieving a goal. Hashing out differences in a civil manner makes people take issues seriously; murder does not. The murders in Paris do nothing to further the killers’ cause, they only weaken it. Now, instead of learning about their position and perhaps being persuaded to their side of the issue, people are angry at the killers and out for justice. 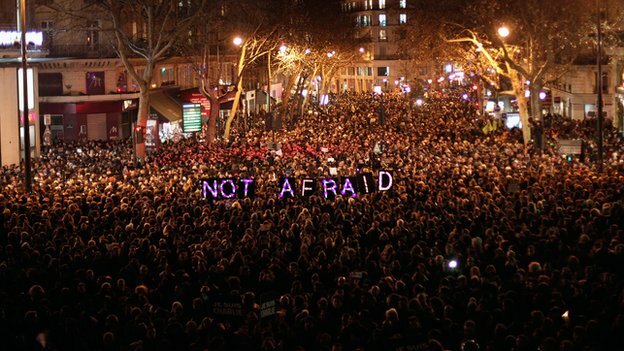 The violent act has spurred support from around the world for Charlie Hebdo and for protecting freedoms. The magazine refuses to stop production, but instead plans for its largest ever print run next week — 1 million copies instead of its typical 30,000. The publisher is getting help from global entities, like Google, to fund the endeavor. Journalists and supporters around the world silently raise pens into the air, a show of solidarity signifying that the pen really is mightier than the sword. Illustrators have worked feverishly to fill the pages of publications and the internet with new political cartoons depicting the heinous acts and attempted oppression. Nearby, the Eiffel Tower goes dark to bring attention to the atrocity and to honor the victims. These are the acts of people defending their freedoms. THIS is how to send a message. But those angry over the magazine attack, and of the horrific hostage situations and shootings today, should avoid displaying ignorance similar to that of the killers. Jumping to conclusions and vilifying an entire group of people — in this case, Muslims — does not help. Doing so smacks as equally of injustice as the original crime. The heinous acts committed by a small group of extremists do not reflect how the much, much larger Islamic community feels. In fact, Islamophobia and general discrimination against Muslims is exactly what the murderers desire. Retaliation against Muslims and Islamic establishments unduly discriminates and merely increases the support for fundamentalist causes. Effectively, extremists use the discrimination as a means of recruiting terrorists. We must not aid their cause by contributing to discrimination. Freedom, unfortunately, comes at a price. We must remember those who are not free and continue to spread the message of freedom for all people around the world. We must fight for our freedoms. We must rise above the extremists and terrorists who work so hard to quash free societies. And we must do so in a respectful, peaceful manner. Just as the voices of the murdered Charlie Hebdo employees deserved to be heard, so too do the voices of peaceful dissenters. In a free society, everyone should be heard without fear of retribution. The free will prevail over oppressors. The free are not afraid and will overcome senseless hateful acts. Together, we remain strong in the face of adversity and show that our cherished freedoms are worth standing up for.